Uganda offers an inspiring all round wildlife and nature experience. This beautiful country was given a name the ‘Pearl of Africa’ by Winston Churchill and boasts the highest concentration of primates in the whole of Africa. Home to 54 different tribes, this extraordinarily lush country is dominated by water. Vast Lake Victoria, the largest in Africa, forms its southern border while Lake Albert, Lake Edward and Lake George in the west continue Africa’s Great Lakes system. Some of Uganda’s best wildlife viewing is found in the far north of the country in Murchison Falls National Park on shores of Lake Albert, Africa’s seventh largest lake, but Queen Elizabeth National Park in the west is more accessible. But it is the chimps of Kibale and the Mountain gorillas of Bwindi that are the true stars. Coming face-to-face with an endangered Silverback gorilla is one of those unforgettable experiences that are at the top of many people’s travel wish list. It doesn’t disappoint! We offer a wide range of Uganda holidays and gorilla trek safaris, all of which can be tailor made to meet your requirements and budget. Call us on +256 773 350036 for some wonderful ideas on holidays to Uganda. The capital city of Kampala is the gateway to Uganda, with the international airport at nearby Entebbe. The easiest way to get around this large country is by light aircraft, but it is also possible to travel to Bwindi by road with your own a driver/guide provided to you by Muleni Safaris Uganda, via beautiful Lake Mburo. In the far southwest of the country, near the borders with Rwanda and the Democratic Republic of the Congo, the forested slopes of Bwindi Impenetrable Forest are home to some of the world’s last remaining Mountain gorillas. This is one of the best places for gorilla tracking and while the length of a trek can change daily, as long as you are reasonably fit, you shouldn’t encounter any serious difficulty. Treks can be from two to four hours each way depending on where the gorilla families and their Silverback males are located. You must be over 16 and not have any colds or infections to track gorillas, as they have little immunity to human germs. It’s essential to wear good walking boots as the terrain is uneven, tuck your trousers into your socks to guard against nettles and bugs, wear gardening gloves to protect your hands and make sure you carry plenty of water. Take weather-proof clothing as these are rainforests, and a warm fleece or jumper, as early mornings in Bwindi can be chilly. Once you locate the gorillas, all the effort of the trek will be forgotten as the encounter is almost without fail a moving and life changing experience. 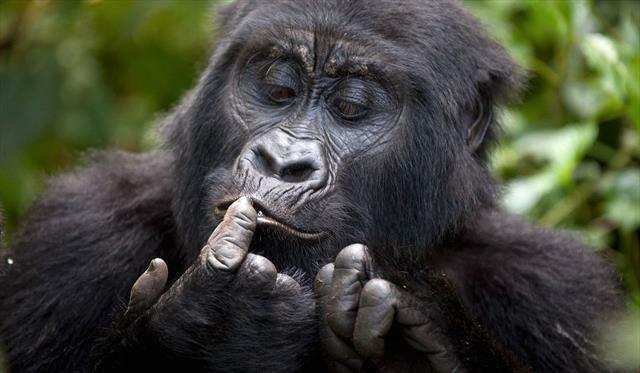 The gorillas are habituated and are remarkably relaxed about the presence of human visitors. Important rules should be observed however, such as remaining seven metres from any gorilla – some of the younger gorillas might let their curiosity get the better of them however – and always listen to your guide’s instructions. If you are adventurous, overland tours offer the most affordable way of viewing the gorillas of Bwindi, travelling in a rugged overland truck and either sleeping in en-suite rest camps, or camping with dome tents. Uganda is also famous for its wild chimpanzee tracking in the Kibale Forest, located in the lush tropical rainforest to the north of Queen Elizabeth National Park. Here almost 1,500 chimpanzees live in protected surroundings and sightings are good. Kibale is also home to a further 12 primate species including the Redtailed monkey, Black-and-white colobus, Red colobus and Greycheeked mangabey. The forest is also rich in birdlife with over 300 recorded species. Uganda is often called a land of lakes because almost a third of the country is covered by water. Located in the west of Uganda, Queen Elizabeth National Park is bordered by Lake Edward and the Ishasha River to the west and Lake George to the northeast. The Kasinga Channel divides the north of the park from the south, with a bridge linking the two sides. These fresh water lakes and waterways are rich in game and birdlife, and a game viewing boat ride on the Kasinga Channel is something you will remember forever. Almost one hundred mammal species live in Queen Elizabeth National Park, Uganda’s most popular wildlife reserve, including ten different primates and about twenty predators, such as lion, leopard and hyena. Elephant and buffalo are numerous and there are many species of antelope including the Uganda kob, bushbuck, topi and the much sought-after semi aquatic sitatunga. The renowned tree climbing lions of Ishasha are located in the southwest of the park and this is also a good area to see leopard. The Ishasha River is home to large pods of hippo and attracts much game including elephant and buffalo. In contrast to the dense undergrowth and mountainous terrain of Bwindi and the rainforests of Kibale, the Ishasha Plains of Queen Elizabeth National Park are wide-open savanna, making it easy to spot the prolific wildlife. At the Murchison Falls, the upper Nile River dramatically plunges 40 metres through a narrow gorge before turning into a quietly flowing river. River-based game viewing is excellent here with abundant hippo, crocodile, waterbuck, elephant and buffalo. Herds of hartebeest, oribi and giraffe drink from the water’s edge, attracting an array of predators. The birdlife is superb with many raptors and we highly recommend a boat trip along the river to the base of the falls. For visitors looking to incorporate some adrenalin activities into a wildlife tour of Uganda, the area around the country’s second city, Jinja, is the place to go. Here the Nile River has its source and the rapids to the north of the town offer good white-water rafting. There is also kayaking as well as spectacular bungee jumping. Alternatively, after your safari head to the shores of Lake Victoria, the largest freshwater lake in Africa with over 3,000 islands. Here you can enjoy island hopping, nature walks in the forest, fishing or simply relaxing on the beach. Bird lovers may want to add on an extension to the marshes of Mabamba, to the west of Entebbe, as this is one of the best places to see the Shoebill stork, one of Africa’s strangest looking birds.